We ourselves introduced the Build-to-Order system to meet our customers demand and this makes the low cost production for our customers preventing from loss stocks and securing the minimum materials for the productions. Also we can correspond to any customer’s needs and demands for the production. We have regular meeting with our staffs about the processes of production and process. Also we investigate problems and improvement points to control the production and quality. Before starting the manufacturing the products, we have the meeting with our customer for a marketing purpose in different stages of developing a product. We strongly believe that this communication with our customers will be able to manufacture the best quality products for our customers. Also we know and understand the spec and characteristic of materials to adjust the small changes in any progress of production. In progress of developing and design, we concentrate to manufacture a product with careful steps. 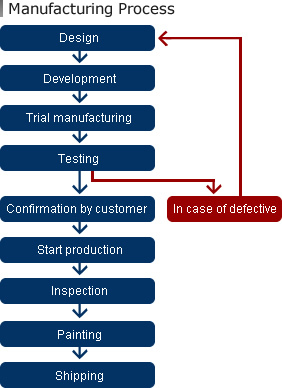 This makes our developing a product and makes a production in short term. Based on the regulation of ISO9001, we can provide our products in stable to our customers with consistent manufacturing system. When a customer needs a trial product with us, we can make a sample as same as a real product to be sold and exam the quality of parts for our customers. We are collecting any data of changes volume sound, changes the spec, performance of engine and other related data in different type of vehicles and motors to correspond to our customer’s demand. We have a regular meeting with our customers to solve the problems for a product and also point out improvements for a product. This is also for our production reformation and improvement of product Quality control. From designing and developing to making into a product, our skilled staffs will operate in prompt for you and will bring the production schedules shorter for meet your demand. As for the mould fee for us to manufacture a product by OEM, we can provide you the estimation for free of charge.